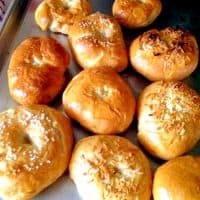 Homemade Bagels Recipe - Fun, easy, and freezes well! 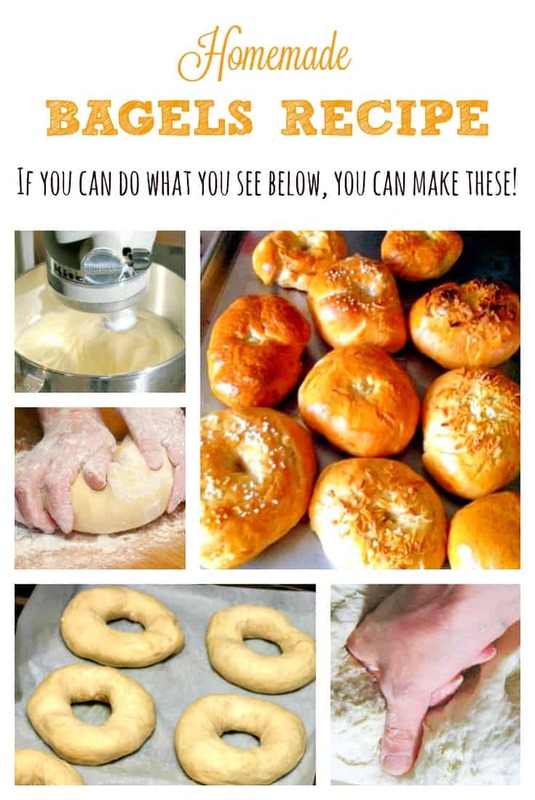 Don’t let the steps in this homemade bagels recipe frighten you: it’s so easy that even beginner cooks can do it! In fact, my son helps me make them at least twice a month now. I love that he helps because I’m a firm believer that kids can cook — and should! I’ve also found that he doesn’t waste them when he helps make homemade bagels. When I buy them from the store, he’ll eat half and leave the other half sitting out getting crusty and stale. (Which is surprising, considering how many dough conditioners and softeners they put in commercially-made bagels.) But bagels he helps make? He’ll eat the entire thing in one sitting. Proudly. 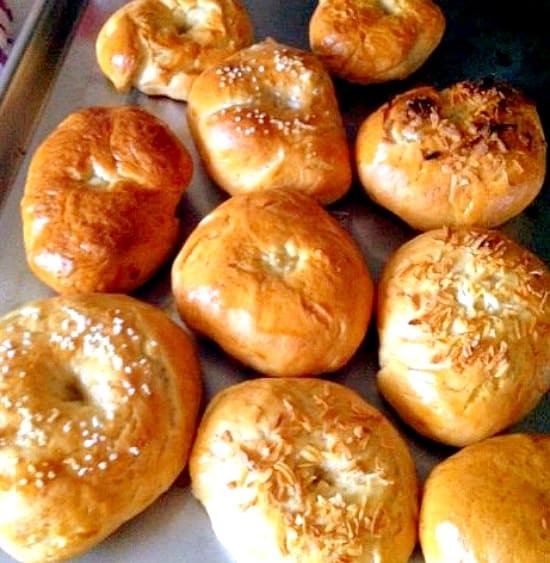 This homemade bagels recipe also skips the high-fructose corn syrup and artificial coloring that seems to be in every commercially baked food these days. You’ll still get the same bagel you love, and any flavorings you like! 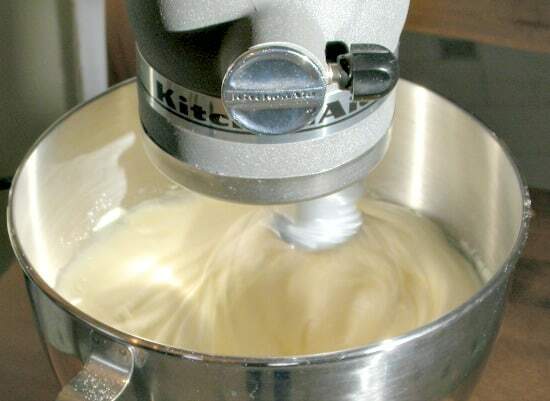 Combine flour, sugar, salt, and undissolved yeast in the bowl of a stand mixer. While beating slowly, drizzle in warm water. Once the water is incorporated, beat on medium speed for 2 minutes, scraping the bowl as needed. Then, gradually add 1/2 cup flour and turn the speed to high. Continue mixing for a minute then add additional flour as needed to make a soft but only slightly sticky dough. At this point you can stir in any flavorings you’d like to add (see ideas below). Turn dough onto a lightly floured board and knead by hand until smooth and elastic. 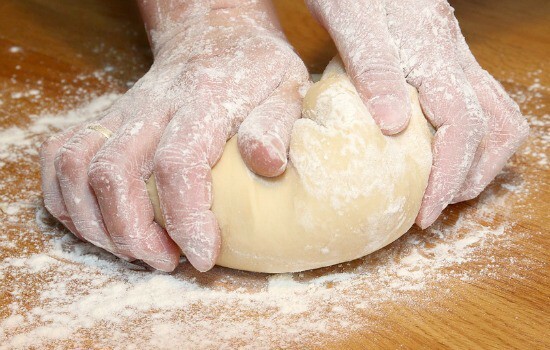 Kneading takes roughly 10 minutes and is one of the most satisfying parts of baking. I don’t know why, but there’s something about the back and forth motion and concentrated effort that’s soothing. Apparently, I’m not the only one to think so, as new research indicates that baking helps combat depression. Who knew? Not in the mood to knead? Then let the stand mixer do it for you for 5 minutes. Next, plop the dough into an ungreased bowl and cover it lightly with a clean towel. This is the first rise, so you want to keep the mixture warm while the yeast works its magic. I usually put mine in the microwave (without starting it), but in the oven with the light on works, too. Or, if it’s warm enough in your home, you can set it on the counter. Just be sure to keep it away from drafts! Wait 25 minutes, and don’t expect the dough to double in size. Once the dough has risen for 25 minutes, punch it down. This is precisely as it sounds: you use your fist and aim for the center. 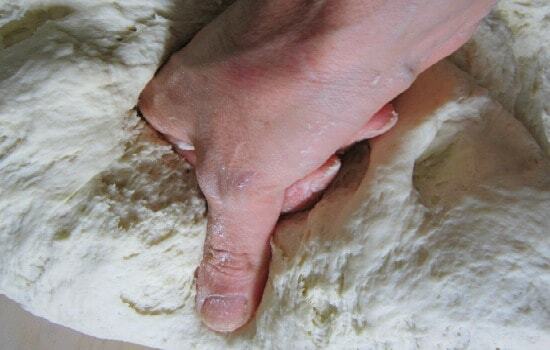 It’s not necessary to be rough; pushing down on the dough once will release any large air bubbles. Once you’ve pushed down, pull the dough from the sides of the bowl and plop the whole thing onto a lightly floured board. Gently shape the dough into a 12-inch log and cut it into 12 equally-sized pieces. Now here’s where bagel-making gets contentious. Purists say that you should now roll the twelve slices of dough into individual logs then shape them on your hand, overlapping the ends by roughly 1/2 inch and gently pressing them together. Busy people (and I’m one of them) take those twelve slices of dough and shape them into balls then poke their thumbs through, forming the ball with their fingers until it looks like a bagel. You make the call. Place the shaped bagels back onto the lightly floured board, or onto a baking sheet lined with parchment paper if that’s easier. Cover them again with the towel and let them rise in a warm, draft-free spot for 20 minutes. I opt for the baking sheet since there’s a bit of moving around from this point forward. There’s a contentious recipe floating around on the internet right now that suggests making bagels without a second rise and without boiling. 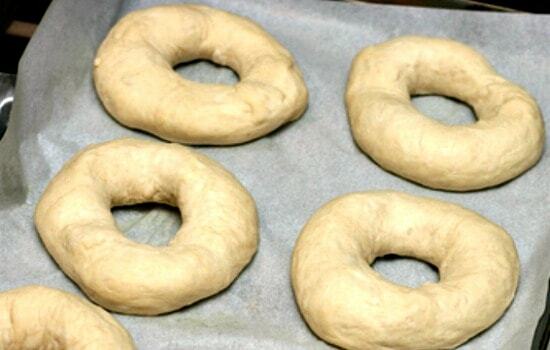 It looks like a delicious recipe, but it’s a recipe for bagel-shaped bread. 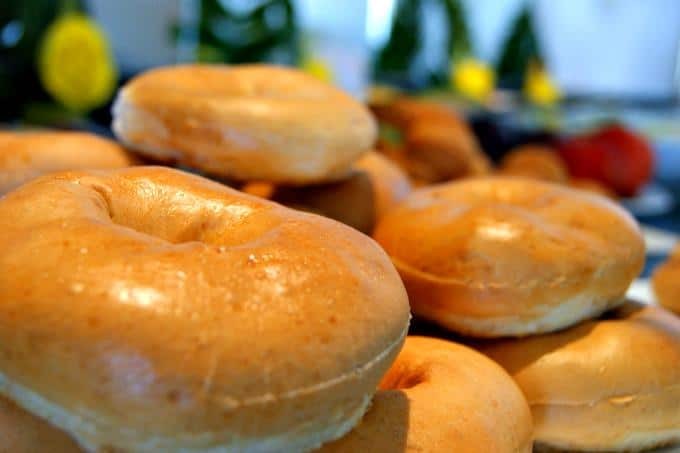 The traditional, centuries-old step of boiling bagels before making them is what gives bagels their firmer, denser texture. So, while the bagels go through their second rise, bring a pot of water to boil and stir in the brown sugar. At the same time, preheat the oven to 375°F / 190°C / gas mark 5. Boil the bagels 3 at a time for 3 minutes. Turn, and boil an additional 3 minutes. (See how easy that is to remember?) Remove them from the water and place them on a rack to cool while you continue boiling the rest of them. When your last batch has cooled for 5 minutes, transfer all of the bagels to two baking sheets lined with parchment paper. Be sure to leave 1 inch of space between them! Bake the bagels for 10 minutes at 375°F. Meanwhile, combine the egg and water to make an egg wash. After 10 minutes, brush the tops of the bagels with the egg wash and sprinkle with any toppings you want to use (e.g., minced onion or poppy seeds). Return them to the oven to bake an additional 20 minutes, or until golden brown. Remove and cool on a rack. If you’re going to freeze them, then for safety’s sake slice them first! That way all you’ll need to do is pry them apart and pop them in the toaster or microwave for a warm, delicious breakfast. Or lunch! Flavored bagels: Mix in your flavorings during step four. Some I’ve used with success are blueberries and strawberries, both chopped fresh ones and thawed from frozen (with most but not all of the juice drained out); homemade garlic powder; onion powder; caraway seed; and crumbled bacon. Baked-on toppings: Add them in Step 12 after brushing with egg white. Some toppings — like minced onion and additional bacon crumbles — go from golden brown to burnt rather quickly, so keep checking in the final few minutes and pull them out of the oven before they burn. 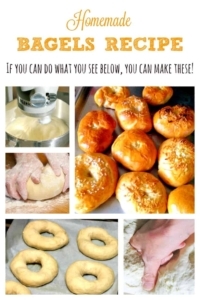 Homemade bagels are easier to make than you think! Enjoy them for breakfast, or as an alternative to sandwich bread. And don't forget the schmear. In a large bowl or the bowl of your stand mixer, combine 1½ cups flour, white sugar, salt and undissolved yeast. While beating slowly, drizzle in warm water. Mix by hand for 4 minutes, or with stand mixer on medium speed for 2 minutes. Scrape bowl as needed. Add ½ cup flour and beat rapidly by hand for 3 minutes, or with stand mixer on high for 1 minute, scraping bowl. Stir in enough remaining flour to make a soft dough, usually around 2 cups. If you're adding flavors, now is the time to mix them in. Turn onto lightly floured board and knead until smooth and elastic (around 10 minutes), or knead with the stand mixer for 5 minutes. Punch down dough and turn onto a lightly floured board. Lightly shape dough into a rounded 12-inch long log. Cut 12 equal-sized slices from the dough log. Push your thumb through the center of each slice to make a hole, and use your fingers to shape the dough around the hole into something that looks like a bagel. While dough rises, fill a large shallow pan with water up to 2 inches in depth. Bring to boil, and stir in brown sugar. 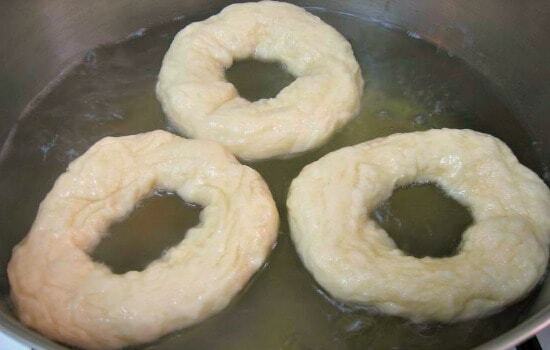 Also while dough rises, preheat oven to 375 F.
Lower heat on stove to a simmer, then add 3 bagels to water at a time. Simmer for 3 minutes, flip, and simmer for an additional 3 minutes. Remove bagels from water with slotted spoon and place on a rack to cool. Grease two cookie sheets or line with Silpat mat. When all bagels have cooled for 5 minutes, transfer them to cookie sheets, keeping them around 1 inch apart. Bake bagels at 375 F for 10 minutes. While bagels bake, combine egg white and 1 tbsp. cold water in small bowl. Return bagels to oven and bake an additional 20 minutes, until golden brown. Remove bagels from oven and cool on wire rack. These look delicious! I’m definitely going to be trying them soon, thanks for the recipe! !